For the first time ever, Redbook is featuring real, everyday women on their cover. The September issue has always been the most important edition in magazine publishing. After all, September is the month when wardrobes are updated with the latest fall and back-to-school trends and mark the beginning of one of the biggest seasons in fashion. The major glossies choose the most prominent celebs and models as their cover stars, and showcase the most lavish looks from designer runways that are simply meant to inspire. This year, however, one magazine has decided to break from this age-old tradition. For the first time in its 122-year history, Redbook magazine is featuring six everyday women on the cover of its September 2015 issue, and the results are stunning and refreshing. Meredith Rollins, the magazine's editor-in-chief, told Fashionista that they have been making an effort to include everyday women inside the magazine, and the next step was to feature these women on the cover as well. "It’s something we’ve really focused on since I got the job a year ago and so: Why wouldn’t it extend to the cover?" she told the publication. The six women are winners of Redbook’s second annual Real Women Style Awards. The group includes women of different ages, ethnic backgrounds and career paths. They were selected by a panel of judges based on photos they uploaded of themselves wearing their favourite styles. The women, who are also style bloggers, styled themselves for the cover shoot, choosing from affordable brands such as Forever 21 and Eloquii, according to Fashionista. Each woman will share their very own style tips in the September issue. "It's impossible not to come away from the issue feeling energized to go out and try something new, which is the whole point of fashion to begin with," Rollins wrote in a blog for HuffPost Women. 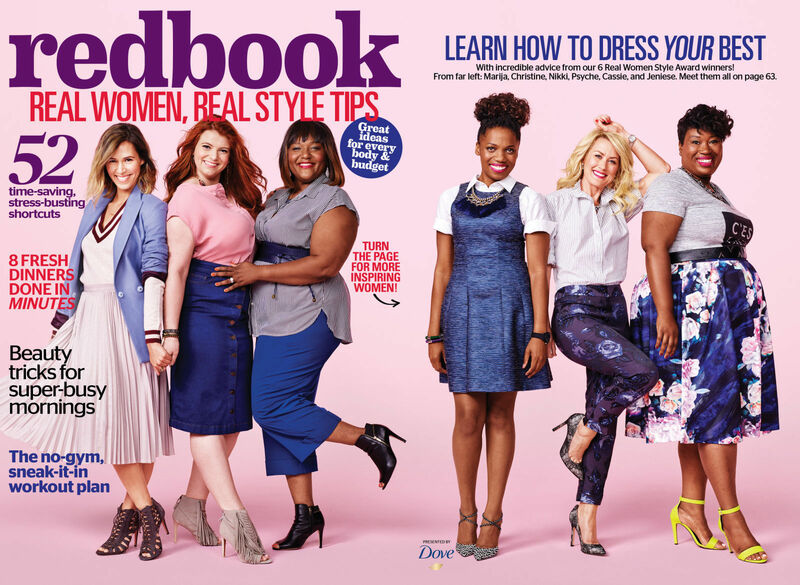 Redbook teamed up with Dove for the issue, who has been featuring 'real' women in their ad campaigns since 2004. Rollins said that, though of course she hopes the magazine "sells gangbusters," the real reward was being able to give real women "a place to shine." "We put great celebrities on the cover, and we've been lucky on the newsstand, but this is just a way to put our money where our mouths are and actually celebrate these women as being just as cool and exciting and inspiring as any celebrity out there," Rollins told Adweek. She's already planning to use 'real women' for the September 2016 issue as well. "September is the month when high-fashion magazines put the biggest celebrities on the cover and highlight the most cutting-edge designer looks," Rollins told Mic. "Those issues are amazing, but our readers want fashion that can work in their actual everyday lives." We hope to see more magazines follow suit. You can pick up the September 2015 issue of Redbook when it hits newsstands on August 18.